This data set consists of 1-km-resolution land cover data for the land area of the Primor'ye and Southern Khabarovsk Regions in the Russian Far East. The data are based on 1990 NOAA AVHRR data. Labeling of land cover classes depended upon the Russian 1990 Forest Cover Map (Garsia 1990), the analyst's experience with AVHRR data, and Russian data sources. There are eight classes distinguished in this data set, five of which are forest cover classes. The data are provided in several different file formats, including binary raster data in Idrisi format, ASCIIGRID raster data in ASCII format (easily imported into ArcInfo), vector data in ArcView shapefile format, and a graphic map in JPEG format (see Figure 1). Please read all documentation before using these files. Figure 1. Land cover map, 1-km resolution, for the land area of the Primor'ye and Southern Khabarovsk Regions in the Russian Far East. Stone, T. A., and P. Schlesinger. 2003. RLC AVHRR-Derived Land Cover, Former Soviet Union, Far East, 1-km, 1990. Data set. Available on-line [http://www.daac.ornl.gov] from Oak Ridge National Laboratory Distributed Active Archive Center, Oak Ridge, Tennessee, U.S.A. doi:10.3334/ORNLDAAC/690. This data set consists of 1-km-resolution land cover data for the land area of the Primor'ye and Southern Khabarovsk Regions in the Russian Far East. The data are based on 1990 NOAA AVHRR data. Eight land cover classes are distinguished. LAND COVER footnote: The eight land cover classes distinguished in this data set are listed above. Please read all documentation before using these files: http://daac.ornl.gov/daacdata/russian_land_cover/landcover_far_east/comp/landcov_rfe_readme.txt, http://daac.ornl.gov/daacdata/russian_land_cover/landcover_far_east/comp/landcov_rfe_projection.txt, and http://daac.ornl.gov/daacdata/russian_land_cover/landcover_far_east/comp/landcov_rfe_mapcode.txt. A binary raster image depicting land cover (1990) in Idrisi format. Note: must be converted to an *rst file when using version 3.2 of Idrisi. Use the Idrisi File Conversion (16/32) utility available in the file pulldown menu to convert to the new format. Also note that the Idrisi v. 2 image documentation file, landcov_rfe.doc, MUST be present for the binary data to be read by Idrisi. Compressed ASCIIGRID version of the binary raster data (landcov_rfe.img). This data file was created by converting the Idrisi binary file (landcov_rfe.img) using Idrisi export utilities. The ASCII file was compressed using the gzip utility available in UNIX. Note: it was necessary to first convert the *.img file to a *rst file and the *doc file to a *rdc file to match the new file format and naming convention of raster data supported by Idrisi 3.2. Vector map version of data (same info as raster data landcov_rfe.img and landcov_rfe.dat) in ArcView shapefile format (compressed). In addition to shapefile components, the zip file also contains an ArcView legend (*avl) for displaying the data in ArcView. 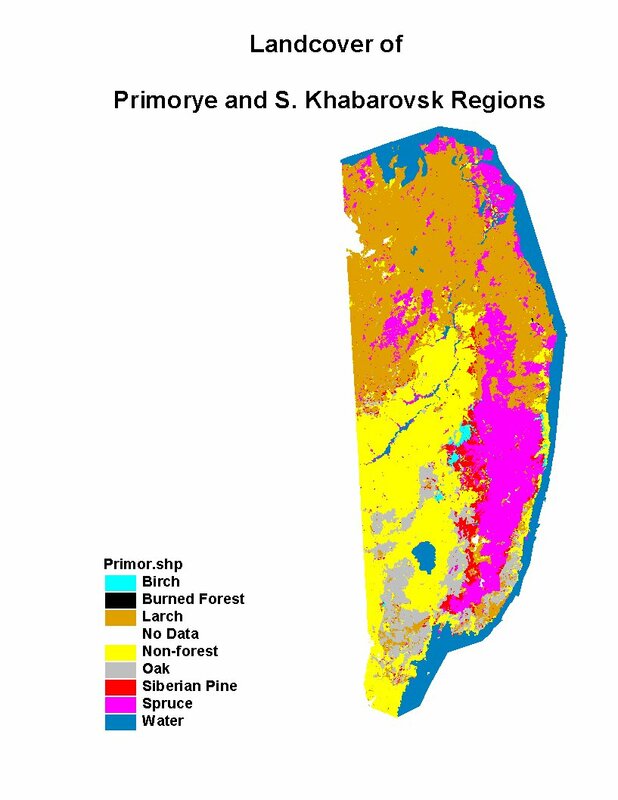 Source satellite imagery data for the Primor'ye and S. Khabaorvsk Region Forest Classification for five dates were acquired from USGS/EROS Data Center. The dates are 5/15/90, 7/18/90, 7/19/90, 8/15/90, and 8/17/90. The first of these images was geometrically registered to Digital Chart of the World (DCW) vector data for the region using forty-seven ground control points; imagery data for all remaining dates were geometrically and radiometrically calibrated at USGS/EROS Data Center. Imagery data for all dates were co-registered in Lambert Azimuthal Equal Area projection using mutually common parameters (see section Processing Changes below for these parameters). Major cloud formations were identified visually and removed from the images prior to classification; minor clouds were removed during classification. Because clouds tend to have unique spectral signatures, being both very bright and very cold, they usually classify easily. Classification of the imagery was accomplished using the Earth Resources Data Analysis System (ERDAS) Isodata algorithm (ERDAS 1991). Imagery data for each date were done separately. The algorithm is an iterative clustering program that is not spatially dependent. Data for each date or scene were clustered into fifty different classes, and signatures for all classes were extracted. The signatures developed were then used to perform the actual classification of pixels with a typical nearest neighbor supervised classification. All signatures were examined to evaluate vegetation vigor indexes and extreme brightness or temperature information. The USSR forest map (Garsia 1990) used in this work covers all of the former Soviet Union at the scale of 1:2,500,000. There are sixteen individual map sheets. Our region of interest is covered by two map sheets: Numbers 12 and 16. These sheets were previously digitized (Stone and Schlesinger 1993). The major or dominant forest types and major inland water bodies are described by the forest map as polygons. It is not clear whether the referenced map describes the majority tree species or the majority economic tree species. In general, Russians we have consulted indicate that the map describes the majority tree species. If this were not the case and the majority of economic tree species were defined by the map, there would be a systematic under-representation of soft deciduous forest species such as birch and aspen. The map defines discreet polygons and, generally, assigns one tree species to that polygon. This is rarely the case in nature, however. Mixed polygons, those having more than one tree species, exist on the map in only one case, mixed spruce-fir. Each satellite-based class was labeled according to the majority class of the Forest Cover Map. For instance, if the satellite class was composed of 70% Spruce, 20% Pine and 10% water, the class would be labeled, according to the Forest Land Cover Map, as Spruce. We produced four digital maps from this effort. The differences between the maps were a result of the order by date in which the classified satellite data were assembled or mosaiked together. The mosaiking of the data is order-dependent - that is, the final classified satellite image added writes over all previous classified data except where the final image has no coverage. This process is like stacking randomly oriented pieces of Swiss cheese where in most locations the last piece added will dominate the appearance of the cheese pile when looking down on it from above. However, in a few locations you can see all the way through the pile; these would be areas for which we have no usable data. In a few other locations you can see down two layers or three layers and so forth. Satellite data added earlier in the stitching process will show in the final map only if the last date added has no data for that region. Therefore, the final map is a mosaic of dates, but it is dominated by the final date added. From this it is easy to see that the order of stitching can have a major effect upon the appearance of the final map. The source satellite imagery data were acquired from the USGS/EROS Data Center, Sioux Falls, South Dakota, U.S.A.
A USSR forest map was used to aid in classification of these data (Garsia 1990) (see the References section of this document). Stone T. A., and P. Schlesinger. 1996. A Landcover Map of the Russian Far-East Based on NOAA AVHRR Satellite Data. A Report to the World Wildlife Fund, Washington, D.C. See http://daac.ornl.gov/daacdata/russian_land_cover/landcover_far_east/comp/WWF_landcover_Stone_1996.pdf . Erdas. 1991. ERDAS Field Guide, 2nd ed. Ver 7.5. ERDAS, Inc.: Atlanta. Garsia, M. G. (ed.). 1990. "Forests of the USSR," Scale 1: 2,500,000, Forest Cartography Department of All-Union State Planning - Research Institute "Sojuzgiprolezhoz." GUGK: Moscow, USSR. Stone, T. A., and P. Schlesinger. 1993. "Translation of the Legend of the 1990 Map 'Forests of the USSR.'" A Report to the Northeast Forest Experiment Station. USDA Forest Service, Global Change Research Program: Radnor, Pennsylvania. See http://daac.ornl.gov/daacdata/russian_land_cover/forest_map_1990/comp/fmap90_legend-4.pdf .